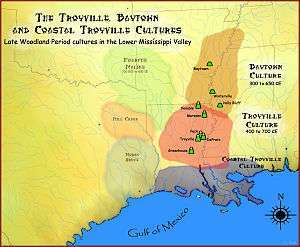 The Troyville culture is an archaeological culture in areas of Louisiana and Arkansas in the Lower Mississippi valley in the southern United States. It was a Baytown Period culture and lasted from 400 to 700 CE during the Late Woodland period. It was contemporaneous with the Coastal Troyville and Baytown cultures (all three had evolved from the Marksville Hopewellian peoples) and was succeeded by the Coles Creek culture. 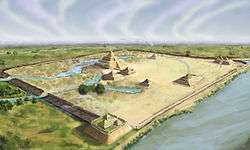 Where the Baytown peoples built dispersed settlements, the Troyville people instead continued building major earthwork centers. The Troyville-Coles Creek people lived on gathered wild plants and local domesticates, and maize was of only minor importance. Acorns, persimmons, palmetto, maygrass, and squash were all more important than maize. Tobacco was cultivated as well, and protein came from deer and smaller mammals, but the bounty of the region kept maize from being adopted as a staple until as late as the thirteenth century CE. 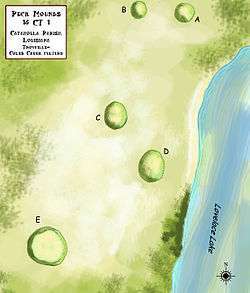 Marsden Mounds A multimound site in Richland Parish, Louisiana near Delhi, Louisiana, with a Poverty Point period component (1500 BCE) and a Troyville-Coles Creek component (400 to 1200 CE). Troyville Earthworks A large multimound site with components dating from 100 BCE to 700 CE. It once had the tallest mound in Louisiana at 82 feet (25 m) in height. It is located in Catahoula Parish, Louisiana in the town of Jonesville. It is the type site for the culture. 1 2 Raymond Fogelson (September 20, 2004). Handbook of North American Indians : Southeast. Smithsonian Institution. ISBN 978-0-16-072300-1. ↑ "Indian Mounds of Northeast Louisiana:Marsden Mounds". Retrieved 2011-10-20. Wikimedia Commons has media related to Troyville culture.